Whether we’re at work or at home, most of us spend significant parts of our day on the computer. While the web is filled with engaging ways to waste time, distractions and lack of organization can be a huge burden if you are trying to use the internet to get things done. If this struggle sounds all too familiar to you, then you need this week’s #WebsiteWednesday, ProgressDash.xyz. 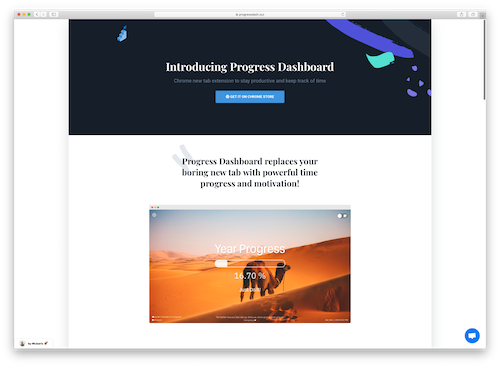 Productivity has reached new levels of comfort and ease thanks to ProgressDash.xyz, the chrome extension that replaces your Chrome browser’s standard “new tab” screen with your own customizable Progress Dashboard. Your dashboard allows you to track time spent on tasks, keep tabs on your overall monthly and yearly work goals, and provides a full breakdown of your goal progress. Complete with beautiful backgrounds and motivating quotes, this dashboard is built to inspire you to succeed in whatever you’re using your computer to do. Best of all, unlike many project management services and productivity tools, ProgressDash.xyz is priced at a very affordable $2. That’s it! One $2 payment and ProgressDash.xyz will give you the tools to organize your browser and transform your computer into a motivational tool rather than a tempting distraction. ProgressDash.xyz has earned 5 stars in the Chrome web store, proof that its thousands of users just can’t get enough of their favorite new productivity tracker. Check out ProgressDash.xyz on Twitter to see why their users are head over heels in love with the service, or use the extra time you’ve saved thanks to ProgressDash.xyz to launch your next big idea in your own .xyz domain! « Previous Post .Monster is really here!